Japanese gamers are getting a new Mario Bros. game, but it's only coming to arcades. There's a new Super Mario Bros. Wii game in Japan, though there's a reason you probably haven't heard about it before this. First of all, the game is an arcade cabinet that has yet to be announced for any other markets. Second, Nintendo licensed the game out to Capcom for development. The game, New Super Mario Bros. Wii Coin World is a four player game where players compete in mini-games to earn medals. 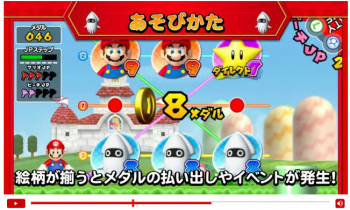 Based on the trailer, platforming doesn't seem like a big part of the title, but there are minigames that seem like Memory and something that looks like a cross between a boss battle from the original Nintendo game and Wheel of Fortune. This might seem like an April Fools' story, but it actually seems pretty legit. Capcom's Japanese site has a full-fledged trailer that you can watch and judge for yourself. What will be interesting to see is if this arcade cabinet eventually makes it overseas to appear here in Western markets.